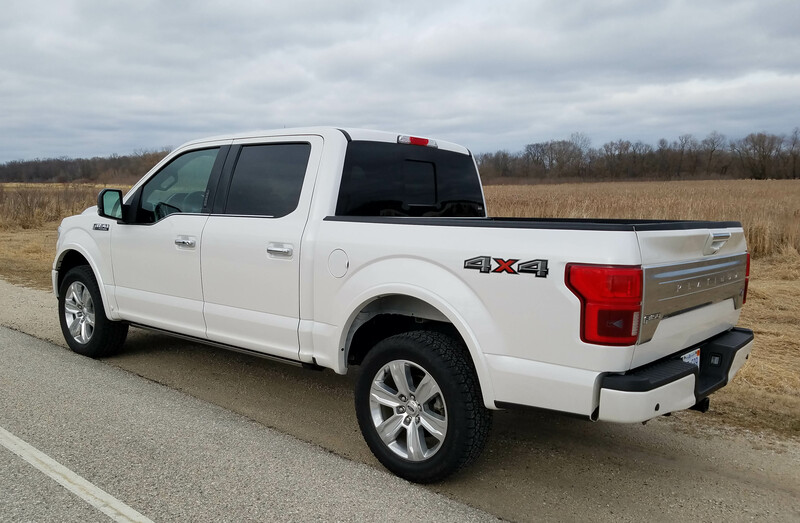 That dichotomy is precisely represented by this week’s test vehicle, the upscale F-150 Supercrew Platinum. Anytime you see the word platinum you can be pretty sure there’s luxury involved and a high price tag to go with it. No exceptions here. 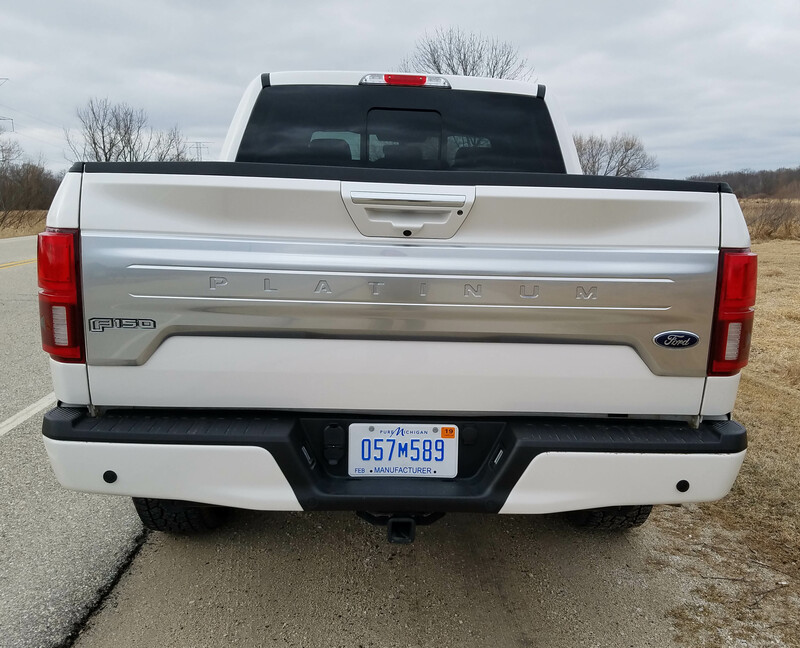 First, you should know that there are at least 23 F-150 trim combinations. That’s certainly more than any car. But think of it, for this, and most any pickup, you have a choice of engines (5), trim levels (7), cab sizes (3) and bed lengths (2), plus either 2- or 4-wheel drive. The combos are enough to make a mathematician’s head (certainly an automotive journalist’s head) spin. The White Platinum test truck, a pearly translucent white, was downright pretty with all its sparkly white accented by chrome trim. This had four-wheel drive, a supercrew cab that includes a full rear seat that will seat three, and a short bed, 5.5 feet. The Platinum trim level is just one off the top level Limited model. 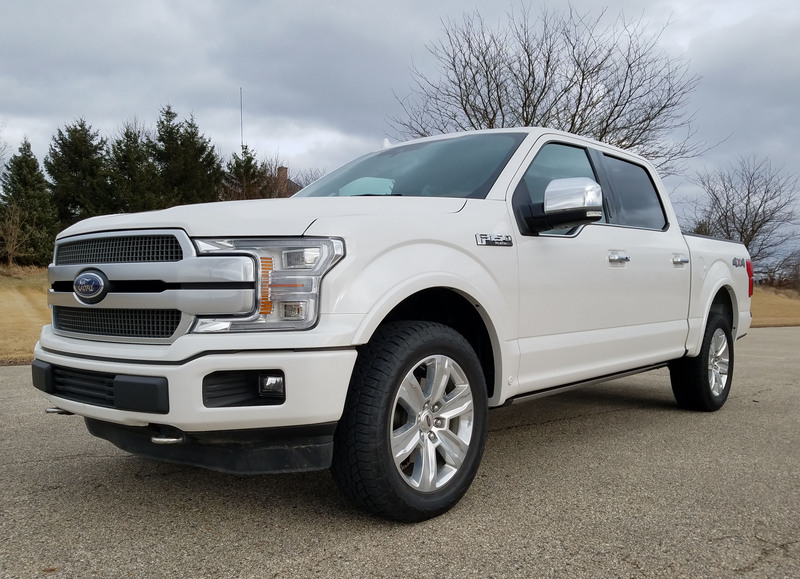 List price is $58,875, including delivery, and with its five options (including the glittery white paint for $595), the test truck ended up at $63,800. I remember when that would get you the finest luxury German sport sedan. A Limited model with 4WD starts at $65,575. But, to be honest, this has as much technology packed into it as any fine sports sedan, and even features an aluminum body that Ford developed a few years ago to cut precious weight by about 800 pounds. Ford lists this as military grade aluminum, insinuating it’s as tough as an angry Seal team that hasn’t eaten in three days. There’s really no question of toughness with the F-150. First, it has been hauling loads of construction materials for the better part of 70 years now. 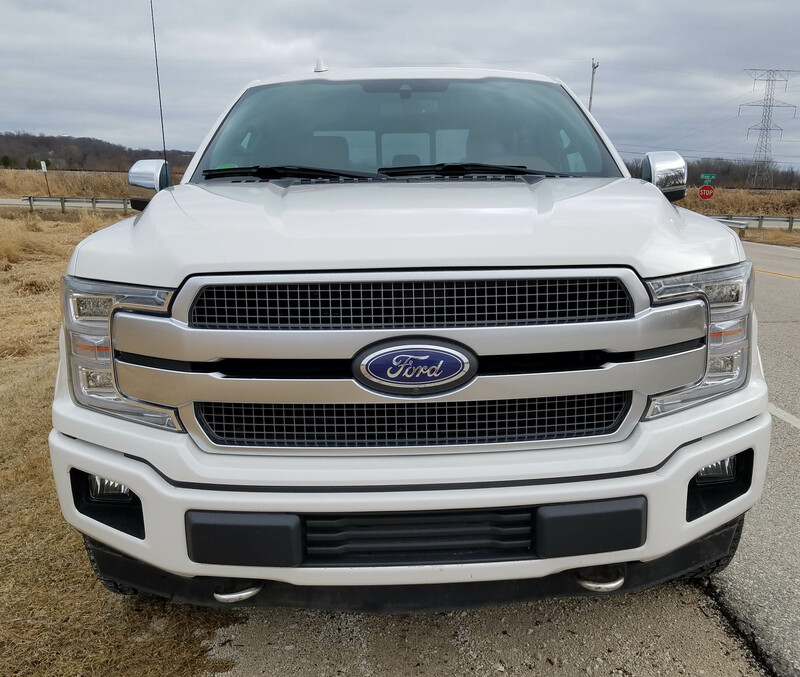 And the current model, with its WiFi hot spot, new grille and headlights, has the highest towing capacity of any standard pickup at 13,200 pounds, depending on the truck’s configuration. The tested Platinum model featured a strong 5.0-liter V8 that churns out 395 horsepower and 400 foot-pounds of torque. 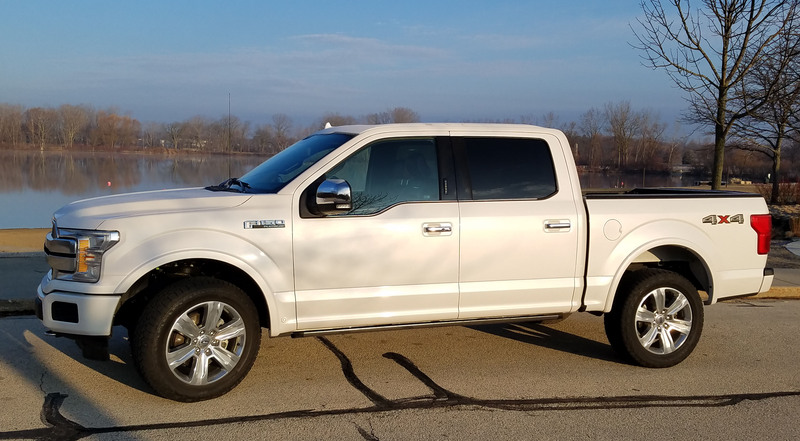 Best yet, the engine runs quiet and slips through its 10-speed automatic’s gears with a smoothness you might not expect in a pickup. While this is a large pickup it blasts up to highway speeds with ease and without making the interior sound like you’re driving a Peterbilt through the Smokey Mountains. In fact, several riders commented on the interior’s quietness. This is pretty close to a luxury sedan’s road noise and engine noise levels. Likewise the truck handles well. The power steering sometimes feels a bit over-boosted, but the Ford was easy to keep within its lane on the highway with very little lane drift. Most trucks have more. Naturally this isn’t built for cornering and with 9.4 inches of ground clearance you’re more likely concerned with clearing that boulder in the field or on the worksite than with challenging an Indycar for cornering precision. Still, because this is such a big truck, 231.9 inches long, it wasn’t overly user friendly in parking lots. You have to plan where you’ll park and leave enough room to back out of a stall. Thank goodness for that backup camera. Ride too is mostly smooth and comfortable, with some truck bounce over sharp bumps and parking lot entry ramps. This is simply the way pickups behave, but the bumps were pretty well controlled, never jarring or abrupt. Taking your luxury pickup off the paved road? Well, there’s a dial on the dash that allows you to switch out of 2-wheel-drive to 4- high or low, or when in changing road or weather conditions, use the 4-wheel-drive automatic setting. That lets the wheel sensors tell the truck’s main computer brain how much power each wheel needs depending on their grip. 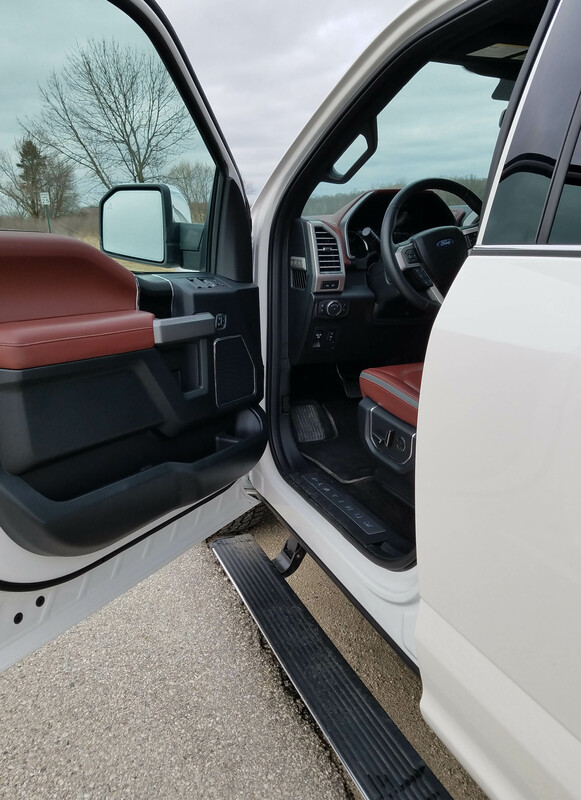 The Platinum model has a stylish (some might say over-styled) interior with the test truck featuring saddle brown dash and seats with black leather trim, a thick leather wheel and brushed metal trim on the dash and console. There’s also matte black trim on the doors. One disadvantage to all that leather work is that there’s stitching on the back of the driver’s seat that put pressure on the middle of this driver’s back. Mildly annoying on a short drive, it could becoming tiring on a long one. But overall the seats are comfortable with mildly contoured seat backs and broad flat lower cushions, which makes it easy to exit the seats. These are powered and easy to adjust, with three driver’s seat memory settings. Front seats are heated and cooled while the rear seats are heated. 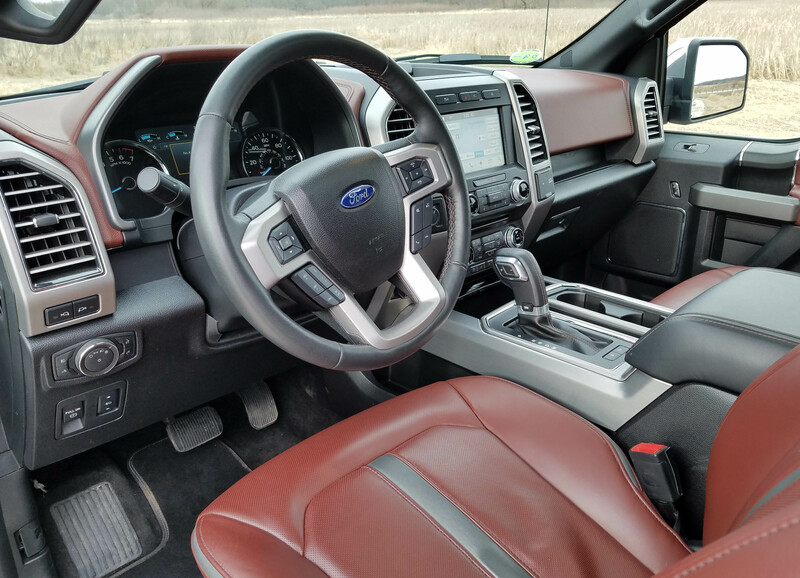 The F-150’s steering wheel also is heated and there are power pedals to adjust along with a power tilt/telescope steering wheel. Coolest are the power running boards that lower when you open a door and power back up flush with the body shortly after the doors are closed. Without these it would be nearly impossible for anyone shorter than 6-2 to enter the truck. But with them, entry is easy. 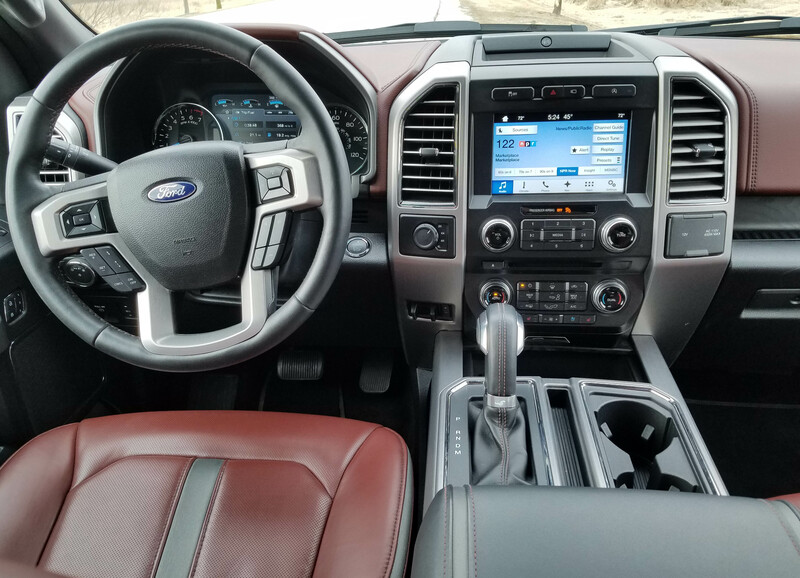 Ford has created an easy to use, well laid out dash and control system with a touchscreen for the radio/nav and other infotainment needs. The radio volume and tuning knobs, along with the dual climate control knobs are large and easy to use. Just under the center stack is a cubby with a variety of electrical hookups and the lane departure warning system is on the console, so simple to turn off when doing primarily city driving. As with most trucks and cars, the adaptive cruise control, radio, phone and computer adjustment buttons are on the steering wheel hub. Overhead are twin sunroofs (a $1,295 option) and a power sun shade, and yes, the large sun visors here slide. In the back of the cab is a power sliding window facing the bed, which included an optional $495 spray-in bedliner. In addition, the tailgate includes a ladder that can be folded from it to help a person get up and into the bed while loading. That’s a godsend for this tall pickup. The running boards power down when the doors are opened. Otherwise it would be a major stretch to get inside. The F-150 has all the requisite safety equipment. In addition to what’s already been mentioned is a blind-spot warning system, park assist, pre-collision warning and braking, pedestrian detection, and a 360-degree camera that is especially helpful when maneuvering in tight spots. Much of that comes via the $2,540 preferred equipment group that includes a tech package. In addition to the safety equipment it includes adaptive cruise control, tailgate step and the stop and go system that turns off the truck engine when the vehicle is not in motion, such as at stoplights. That’s to save gas. On the practical side, the test truck averaged 17.2 miles per gallon in a week’s drive with about 60% being highway miles. The EPA rates this truck at 17 mpg city and 23 mpg highway. 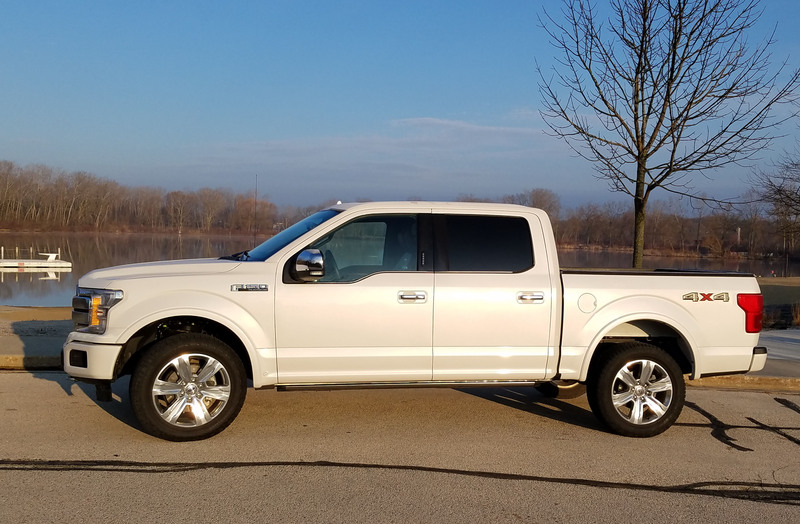 Note too that you can get an F-150 XL supercrew with short bed, 2-wheel-drive and a flex fuel V6 that generates 290 horsepower for $35,545. That model features a 6-speed automatic. Moving up to 4WD bumps the price to $39,055. In addition to the base V6 and the tested V8 there is a 2.7-liter twin-turbo Ecoboost V6, a 3.5-liter twin-turbo V6 that creates 375 horsepower and then the monster 3.5-liter twin-turbo V6 used in the off-roading special, the Raptor. It churns 450 hp and 510 ft.-lbs. of torque. For the record, the cab choices are standard, Super Cab, extended with room for jump seats behind the front row, and Supercrew with four doors and a full rear bench seat. Bed lengths are either short at 5.5 ft., or long at 6.5 ft.
Not enough choices? A turbo-diesel engine model is coming soon. You want choices? Pickups, and Ford in particular, offers oodles of them. Hits: Strong power, easy handling, smooth shifts, 4-wheel-drive, reasonable ride, power running boards ease entry. Roomy quiet interior with heated/cooled front seats, heated rear seats, heated wheel, twin sunroofs, easy well laid out controls with touchscreen, plus lined bed, power sliding rear window and loaded with safety equipment. Misses: Big truck so not parking-lot friendly, plus leather seat stitching put pressure in middle of driver’s back.